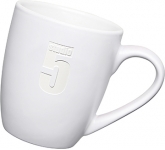 Why buy promotional espresso mugs? 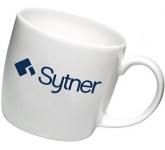 Espresso mugs make for special corporate giveaways! Espresso is the coffee of business people; everyone knows that. But what makes this type of coffee particularly special? It's effective, tasty, and small-sized. Also, it comes in two subcategories: with and without milk. So, both those who love their strong black coffee and those who prefer a lighter taste can enjoy a flavoursome cup of espresso of their choice. But you don't want to focus on the actual coffee now; there's something more valuable here for you and your brand - espresso mugs. Since so many big corporations use espresso in large quantities day after day, why not make the most of it and put yourself on their radar? Espresso mugs provide for an easy way in! Even the most expensive and the prettiest promotional product could turn out to be useless if it doesn't end up in the right place at the right time. What's the use of a promotional item that a person uses at home or in a low-traffic area? - None. On the other hand, promotional items that people tend to use at big companies are bound to bring the desired results. Just imagine what a coffee break looks like in a huge corporation. Countless espresso mugs all over the place, that's right. 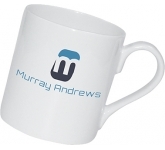 Now, imagine your logo, slogan, text, picture, or a phrase about your brand on those promotional mugs. The people using them will have to notice them sooner or later. And that's exactly what you want; to put your brand out there in the world. Investing in promotional products can be a tricky venture. Ideally, you would want to spend as least as possible and achieve the best return on your investment. While being overly preoccupied with the cost isn't the right way to go, clearly spending too much isn't a good solution either. Luckily, espresso mugs are somewhere in between these two extremes. As such, they are a pretty good choice when it comes to promotional gifts. Why is that so? Well, espresso mugs will definitely bring results, last for a long time, and they won't make you break your budget. Depending on your personal preferences, or the effect you want to achieve, you can choose from a wide variety of espresso mugs. Our diverse selection includes, mini marrow mugs, Boston espresso china mugs, coloured espresso mugs, Dinky Durham mugs, etc., to name just a few. Whatever you choose, you can expect quality. 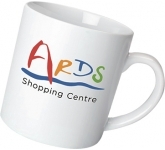 These mugs are made of bright white grade-A earthenware or high-quality china. There will be no pit marks, no discolouration, no scratches, or anything of that kind (even after prolonged use). 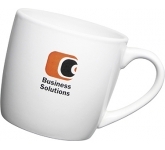 You can be sure that your espresso mugs will last for a long time, putting your brand on the radar in an effective, yet subtle way. 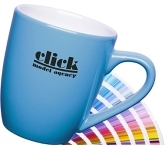 We offer a variety of printing options on our vast range of promotional espresso mugs, ranging from screen printing right through to the very latest in UltraHD print technology allowing us to reproduce full colour images and logos to a standard most suppliers can only dream of. Our team of professional graphic designers are always on hand to offer expert advice in product selection and to ensure that your logo and message is reproduced to the highest quality, representing your brand in the very best possible way. We continually check our prices daily against all the leading UK suppliers and manufacturers to ensure that you, our customer is receiving the very best possible prices. 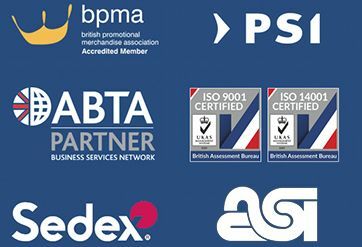 So, if you are looking for low cost, budget, value or cheap espresso mugs, and happen to find the same mugs cheaper, with the same print specification and turnaround, just let us know and we will match the price and back it with our industry Award Winning Customer Service - that's our guarantee! 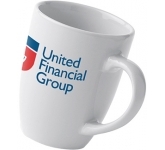 For additional information on our range of printed espresso mugs or how promotional mugs can help your business, why not contact us and have a chat to one of our dedicated account managers who will be happy to advise you further.